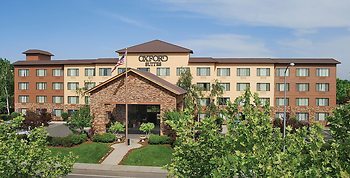 Hotel Oxford Suites Chico, Chico, United States of America - Lowest Rate Guaranteed! With a stay at Oxford Suites Chico in Chico, you'll be within a 10-minute drive of California State University-Chico and National Yo-Yo Museum. This hotel is 28.3 mi (45.5 km) from Lake Oroville and 30.7 mi (49.5 km) from Rolling Hill Casino. Could make reservations for a handicap room. Currently it is first come first served. When in Chico i always stay at the Oxford Suites because it's clean, friendly, and u feel safe. The employee that checked me in was awesome. I travel for work and thought he did a great job making me feel welcome. He sincerely seemed to like his job. They also accommodated our dog and provided a little welcome package with a bag, water bowl and some treats. Beds could be a little more comfortable...not bad, just typical hotel beds. Nice hotel, being pet friendly is what really brought us here. The bed was extremely comfortable. The breakfast was very good. It was very quiet and clean. We would definitely stay again. I really enjoyed the staff as they went out of their way to help me! We did not need to check out until noon and so I got up and went down stairs to eat leaving my husband sleeping in the room. Our room as very close the elevator so we heard the door open and close all night long! Then the next day when my husband wanted to sleep the maids came to the room at 9:30 and knocked on the door as they wanted to clean the room. So my husband was not happy as he got very little sleep because of the elevator door opening all night long! The room was clean! the two front desk staff who checked us in were excellent, so helpful and upbeat. They even called for a taxi. One thing I would like to suggest is the noise level could be lessened with lighter doors and heavy carpeting. the morning rush hour was loud and disturbing. We did enjoy the breakfast! thanks so much. Logos, brands, and other trademarks featured within this site are the property of their respective trademark holders. These trademark holders are not directly affiliated with Hotelsone. Oxford Suites is a registered trademark.© 2001 - 2019 HotelsOne. All rights reserved.